Capcom completed its initiative of putting all of the classic Breath of Fire games on portable gaming devices this past week, extending to both the PS Vita and New Nintendo 3DS. 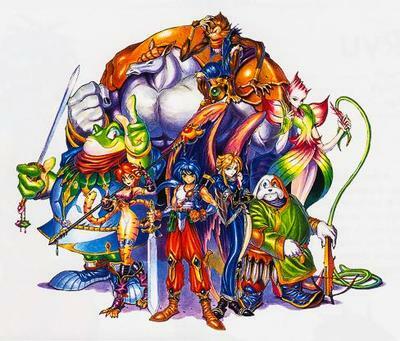 This Thanksgiving saw the release of Breath of Fire II on the New Nintendo 3DS Virtual Console. With this release, Breath of Fire and Breath of Fire II can both be played on the New Nintendo 3DS Virtual Console. Both were originally Super Nintendo games back in the early 90s, and while they were not especially ground-breaking, they featured fun casts of characters and interesting anthropomorphic worlds. Breath of Fire II is further loved for its town building system, one of the first of its kind, and the largest cast in the series. Rand and Katt were always my favorite, but there isn’t a single weak point of the each. Each character is a ton of fun. Both Breath of Fire and Breath of Fire II were also ported to the Game Boy Advance with a much friendlier level-up systems. As for Breath of Fire III and Breath of Fire IV, both are playable on the PlayStation Vita. Breath of Fire IV was actually the first game to be released as a PSOne Classic back when Sony and Nintendo first started putting out the classic games. Breath of Fire III was only made available earlier this year when Capcom released the PSP version of the game. The PSOne version was held up by copyright problems, but Capcom fought to get this updated version into our hands. Buy it now! The only Breath of Fire game not playable on a portable device is Breath of Fire: Dragon Quarter. While it is an official game in the series, many fans treat it as sort of spin-off because it is so radically different from the first four games. Breath of Fire VI exists in Japan as a mobile game, but I rarely hear about it or its success. I don’t think it caught on with the fanbase of the classic games, nor do I think it will ever get an English release. That being said, I have a hard time seeing Breath of Fire exist in any form on the modern market. The series was never about being cutting edge, and Capcom traditionally used classic formulas set by Dragon Quest and Final Fantasy as a basis for their stories. With Dragon’s Dogma and Monster Hunter both in the world, Capcom’s “dragon” games are already spoken for across two franchises that potentially sell a lot better. A modern day Breath of Fire would either be a fun single player JRPG on the Nintendo 3DS or an open-world game that shadows Final Fantasy XV. I wouldn’t mind seeing it find a happy middle ground on the Nintendo Switch, but that’s just the optimist inside of me speaking. It’s a series we’ll probably never hear from again, but with the entire library now available easier than ever, that should be enough to hold for a while.